This page outlines the Mentor for Purpose Workshop series. It is intended for organizations that have or want to develop a mentor program. Capability-building has always been a focus for LSN and mentoring is one of the best ways to do that. LSN has combined our life skills toolbox and passion for Purpose to create a workshop series as a way to further develop mentoring skills. We are working with social service professionals and volunteers to develop and deliver this content. As always, it is free to non-profits in the area. All content is being developed in modular format. You can pick the topics that are right for you and your organization. Ideally, you start with the Live with Purpose event (one of our learning events). Then add one or more modules (see the Masterplan below). Each module can be conducted in 30-60 minutes. 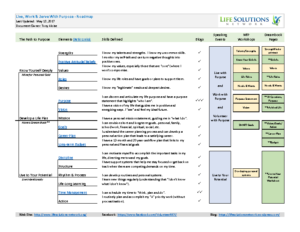 Each module contains a toolbox of instructor plan, lesson plan, slides, templates and a handout. Content is associated with our Life Skills Wiki. The templates are part of the “dreambook” series. This is our concept to document a life plan. Although it is primarily intended for mentors, the content can easily be used by staff or volunteers with direct service clients of an organization. Note that the Life Solutions Network does not directly serve clients; we engage staff and volunteers at local organizations to “serve to their purpose, passion and potential“. We support and encourage purposeful mentoring conversations and processes in formal roles (volunteer coaches and managers) and everyday life (parents, friends and co-workers), ultimately focused toward “people in need” and lifting people up. The LSN-developed content is sought-after, innovative and effective. It fills a gap in organizations that mentor. Mentoring 101. This provides and overview of the key skills in a 90 minutes workshop. The Mentor for Purpose Roadmap outlines key skills needed by mentors and mentees. Contact us if you want to learn more or see some of the content. It is not posted on-line.